This article is about the naval vessel. 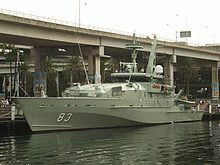 For the Australian TV series, see Patrol Boat (TV series). A patrol boat (also referred to as a patrol craft, patrol ship or patrol vessel) is a relatively small naval vessel generally designed for coastal defence duties. There have been many designs for patrol boats. They may be operated by a nation's navy, coast guard, police force or customs and may be intended for marine (blue water) or estuarine or river ("brown water") environments. They are commonly found engaged in various border protection roles, including anti-smuggling, anti-piracy, fisheries patrols, and immigration law enforcement. They are also often called upon to participate in rescue operations. Vessels of this type include the original yacht (from Dutch/Low German jacht meaning hunting or hunt), a light, fast-sailing vessel used by the Dutch navy to pursue pirates and other transgressors around and into shallow waters. They may be broadly classified as inshore patrol vessels (IPVs) and offshore patrol vessels (OPVs). They are warships typically smaller in size than a corvette and can include fast attack craft, torpedo boats and missile boats, although some are as large as a frigate. The offshore patrol vessels are usually the smallest ship in a navy's fleet that is large and seaworthy enough to patrol off-shore in the open ocean. 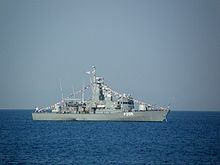 In larger militaries, such as in the United States military, offshore patrol vessels usually serve in the coast guard, but many smaller nations navies operate these type of ships. During both World Wars in order to rapidly build up numbers, all sides created auxiliary patrol boats by arming motorboats and seagoing fishing trawlers with machine guns and obsolescent naval weapons. Some modern patrol vessels are still based on fishing and leisure boats. Seagoing patrol boats are typically around 30 m (100 ft) in length and usually carry a single medium caliber artillery gun as main armament, and a variety of lighter secondary armament such as machine guns or a close-in weapon system. Depending on role, vessels in this class may also have more sophisticated sensors and fire control systems that would enable them to carry torpedoes, anti-ship and surface-to-air missiles. Most modern designs are powered by gas turbine arrangements such as CODAG, and speeds are generally in the 25–30 knots (46–56 km/h; 29–35 mph) range. They are primarily used for patrol in a country's Exclusive Economic Zone. Common tasks are fisheries inspection, anti-smuggling (usually anti-narcotics) duties, illegal immigration patrols, anti-piracy patrols and search and rescue (law enforcement-type of work). The largest OPVs might also have a flight deck and helicopter embarked. In times of crisis or war, these vessels are expected to support the larger vessels in the navy. Their small size and relatively low cost make them one of the most common type of warship in the world. 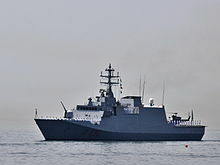 Almost all navies operate at least a few offshore patrol vessels, especially those with only "green water" capabilities. They are useful in smaller seas such as the North Sea as well as in open oceans. Similar vessels for exclusively military duties include torpedo boats and missile boats. The United States Navy operated the Pegasus class of armed hydrofoils for years, in a patrol boat role. The River Patrol Boat (PBR, sometimes called "Riverine" and "Pibber") is a U.S. design of small patrol boat type designed to patrol waters of large rivers. 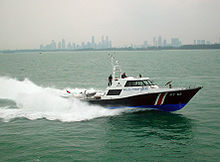 Harbour security boat (PBI) – 4 newly built 80 ton class harbour security / patrol boats, and more are planned in order to take over the port security / patrol duties currently performed by the obsolete Shantou, Beihai, Huangpu, and Yulin classes gunboats, which are increasingly being converted to inshore surveying boats and range support boats. 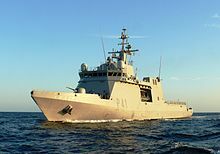 OPV-83 "Marinero Fuentealba". This unit has reinforced hull for Antarctic operations. 06 MICALVI Class Patrol vessels built in ASMAR. 18 Protector Class Patrol crafts built by ASMAR under license of Fairey Brooke Marine. 04 DABUR Class Patrol crafts built in Israel. 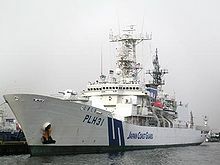 The Indian Coast Guard's offshore patrol vessel ICGS Vishwast (OPV-30) at the port of Kobe, Japan. FPB 28, Indonesian Police and Indonesian Customs, 28 meter long patrol boat made by local shipyard PT PAL. FPB 38, Indonesian Customs, 38 meter long aluminium patrol boat made by local shipyard PT PAL. FPB 57, Indonesian Navy, 57 meter long patrol boat designed by Lurssen and made by PT PAL, ASM and heli deck equipped for some version. PC-40, Indonesian Navy, 40 meter long FRP/Aluminum patrol boat, locally made by in house Navy's workshop. Shikishima (Japan Coast Guard), the largest patrol boat. Mizuho-class (Japan Coast Guard),Large patrol Vessel with helicopter deck and hangar. Tsugaru-class (Japan Coast Guard),Large patrol Vessel with helicopter deck and hangar. Hida class (Japan Coast Guard), high-speed Large patrol Vessel with helicopter deck. Aso class (Japan Coast Guard), high-speed Large patrol Vessel. Hayabusa-class (JMSDF,Japanese Navy), Corvette class patrol vessel by JMSDF(Navy) Fleet. Protector class patrol boat P52 of the Maritime Squadron of the Armed Forces of Malta. ARM Oaxaca, lead boat of the Oaxaca-class. Durango-class offshore patrol vessels in formation. The Swedish Coast Guard operate an additional 22 patrol vessels for maritime surveillance. ^ "Brazil getting armored vehicles, boats". Space War. Space Media Network. UPI. 10 August 2012. Retrieved 19 August 2017. The first-of-class Amazonas was constructed at BAE Systems' Portsmouth facility. ^ "Gunboats Class Osprey 55". Hellenic Navy. 2008. Archived from the original on 2008-05-30. Retrieved 2008-07-15. ^ "Gunboats Class Osprey HSY-55". Hellenic Navy. 2008. Archived from the original on 2008-05-30. Retrieved 2008-07-15. ^ "Gunboats Class Asheville". Hellenic Navy. 2008. Archived from the original on 2008-05-30. Retrieved 2008-07-15. ^ E.A. Pagotsis (2009). G. Christogiannakis, ed. Hellenic Defence Report 2009-2010 (Yearbook of the magazine Hellenic Defence & Security). Athens: Line Defence Publications Ltd. p. 81. ^ "Naval Service - Defence Forces". www.military.ie. This page was last edited on 3 April 2019, at 17:32 (UTC).